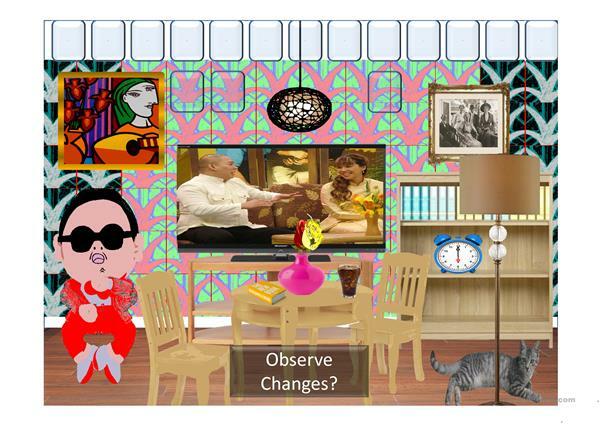 An interactive PowerPoint slide that can be fun for the students for simple past and simple future. Observe changes: click on it to allow the students to see what changed in real time. Click on again and the students will not be able to observe the changes until after 1.5 seconds. Click on the white buttons to add, change or make something disapear in the room. Some buttons have 3 possible changes/additions. Have fun. Written in 2007. The present printable, downloadable handout is intended for business/professional students, high school students, elementary school students and adults at Intermediate (B1) level. It is valuable for revising Future tenses and Past simple tense in English, and is useful for strengthening your class' Speaking skills. It is focused on the topic and words of Home.